It is April 9th and the only spring we have so far here in Munich is the spring we create and style in our happy homes. A bitter truth. But on the other hand, the eternal grey skies and cold temperatures gave me a lot of time to restyle my home and bring in a spring spirit with colours, textures, patterns, botanicals. So this week I am sharing a very spring inspired room with you. Notice the use of those styling elements in this room – it really works well together and makes the place look styled but not completely contrived. Pattern: The pattern of this cushion works perfectly to create interest and the colours in it mirror the dominating colour palette. Texture: The added sheep skin makes the sofa nook very homey and snuggly. Varying textures are key to a great and appealing interior styling. Colour: I am a colour lover, you know that. 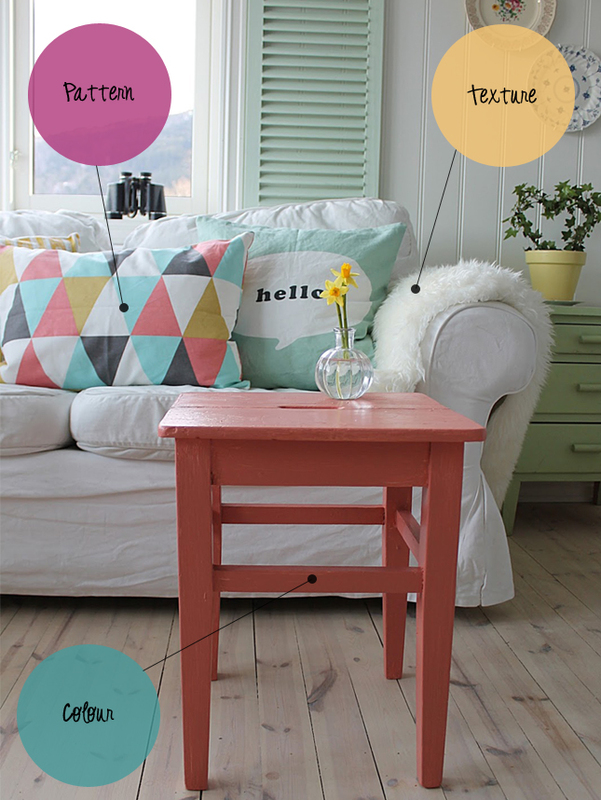 And here the colour palette is dominated by the coral hue of the stool/coffee table and the mint hues of the shutter, the chest of drawers and the cushion. It makes spring almost tangible, don’t you agree? What caught your eye instantly in this room? Interessanterweise hab ich den Tisch im Vordergrund als Allerletztes wahrgenommen. Als allererstes das schöne Kissen mit dem Muster und den mintgrünen Fensterladen. Verrätst Du mir noch was das für den Kupfer(? )kerzenständer auf dem einen Instagram-Bild ist? Oha, ich bin gerade superpositiv vom Preis überrascht. Ich dachte, da muss bestimmt noch ne 0 dran… 🙂 Der Bestellfinger zuckt! Danke für den Link! Wonderful room! My eyes were lead to this great minty “Hello” pillow. Would love to have it on my sofa. 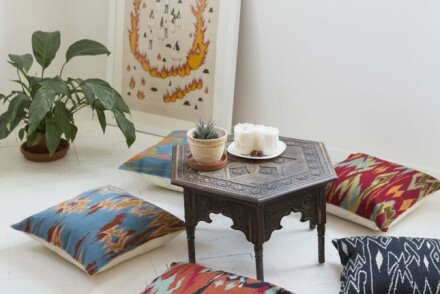 LOVE that graphic cushion! There’s always something pretty going on over here, Igor! Oh, thank you very much Holly! ps. gosh I must be really deprived of spring since I’m wishing to turn up the colour dial! Me? I can’t believe it. Ha!! any ideas on where i can purchase it?? perfect! i love every part of this room, patterns and colors are just my cup of tea. Ui, das ist wirklich ein Träumchen 🙂 Liebe Grüße! Πολυ ωραιο το εσωτερικό πατζούρι! Thank you for sharing the source, Monika!